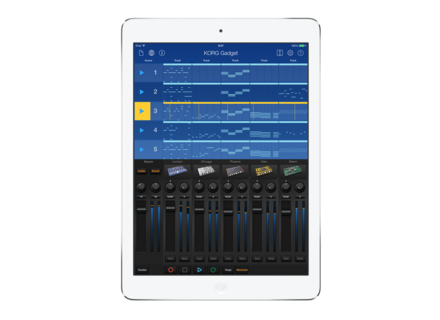 Gadget, Virtual instrument for iPhone / iPod Touch / iPad from Korg. afone1977's review (This content has been automatically translated from French)" Fascinating !!!" I use it for 1 year soon, he served as dozens of applications into a single unified and ergonomic. ...... The same time it is not a DAW but also a sophisticated groove box is she publishing term. It remains a favorite app and with a good quality / price ratio, a nice groove box software that has absolutely no shame in facing the competition hardware in a budget of € 600-800. 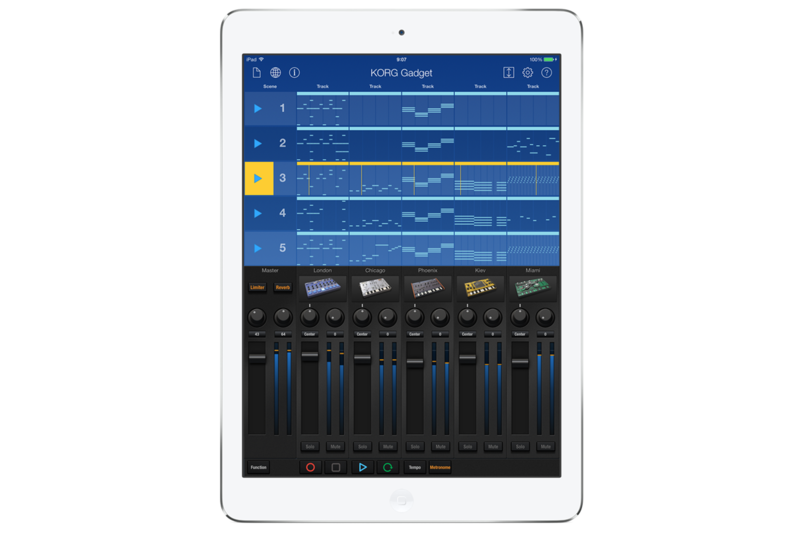 This is an advanced groovebox running on ipad, ideal for creating loops in export to another project, create the foundations of a song. Off invoice rebates (all options and Korg included module) up to 70 €, it is in the top of the basket but completely justifiable seen the product and monitoring that goes with it. Following various updates (4 or 5 some relatively major) comes the app has some ergonomic maturity. It is stable but greedy and only a recent iPad allows to draw all the salt. The documentation is in PDF, complete but totally unnecessary use. General way, the app genere sound "effective", very "phatt" and connoted with presets "club"
Each gadget / module generates a type of sounds with a limited number of parameters, but useful, do not expect a sound treatment of last generation and innovative synthesis, remains in the digital synthesis that sounds and PCM playback without frills but which has proven itself. that each gadget is a personality has both graphic and sound makes the use even more fun and immersive. About the modules, they just offer something complete the gadget "Marseille" too generalist paliant everything related to the acoustic pianos, Clavinet, organ and rhode. The sound is generally good and quite usable. Oriented string / brass module is also present, qualitatively consistent with the rest of the range (few parameters but effective with the right circles between simplicity and opportunities enough to avoid many modulation own frustration in a certain app ios). The effects are enough with only 2 parameters Indeed, an update to integrate the effects module within any gadgets would be welcome. More space for the effects also. For export it is audio only, with all that is possible as well as export in ios * .als for those using live. Krisskano's review (This content has been automatically translated from French)" Shame ..."
I use it for two days intensively. I hate lag whatsoever with midi keyboard or touch screen. The value for money is good, now if I have to change my iPad to use it fully so it will not do. I acquired to make music wherever I can, write down my ideas, compose. It complements the collection of music app that I already have on the iPad. Very easy to use and learn, yet it is rather stable, but because there is a but, it is not optimized for any ipad 3 when previous generations not even bother to think about it ! Noon and in control even with the touch screen, the application has a half second behind the iPad 3 so unplayable live, program block by block, which does not bother me too much but becomes tedious for a chorus of pffff synth. The sound is huge! I'm pretty sitting at the listening. Maybe the audio engine requires a lot of resources and it is for this reason that my machine rowing block! And this from the very first programmed trac! Synthesizers can be crushed and live app saves all your manip, it's really not bad at all. The sound and usability are present!